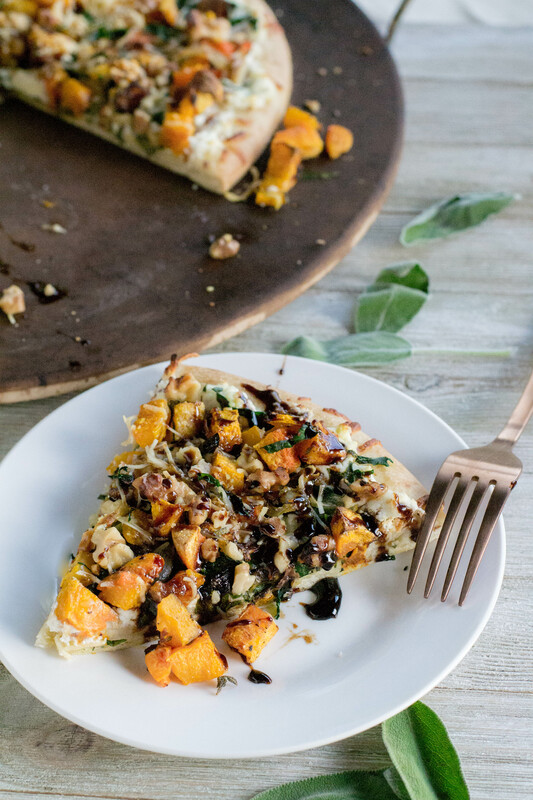 Roasted Butternut Squash Pizza with Balsamic Glaze - What the Forks for Dinner? It seems like forever that we made a pizza!! Whats up with that?? 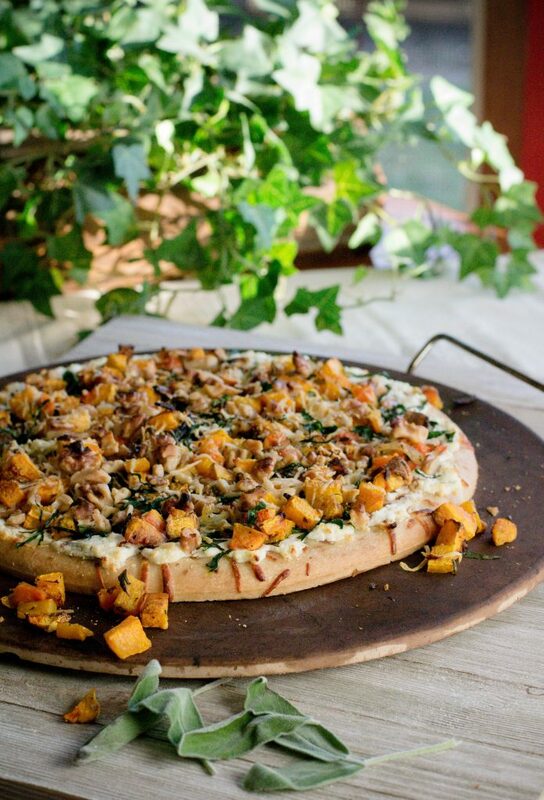 Roasted Butternut Squash Pizza with Balsamic Glaze ……..now there is a mouthful …..a mouthful of delicious!!! Fall brings out the best of the best in the world of squash. 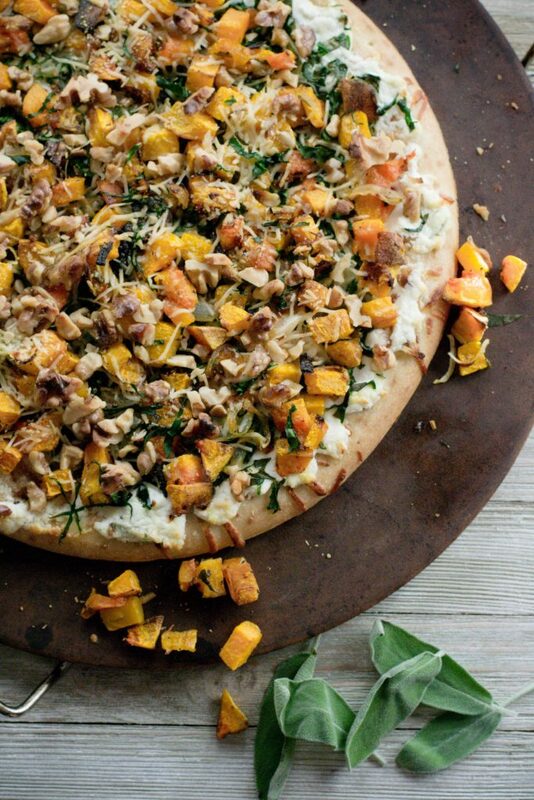 Acorn, butternut, spaghetti, as well as pumpkin are just a few of the bounty that is fall squash. Epicurious has a great article with visuals that will tell you all you need to know about these beauties. Click here to read. 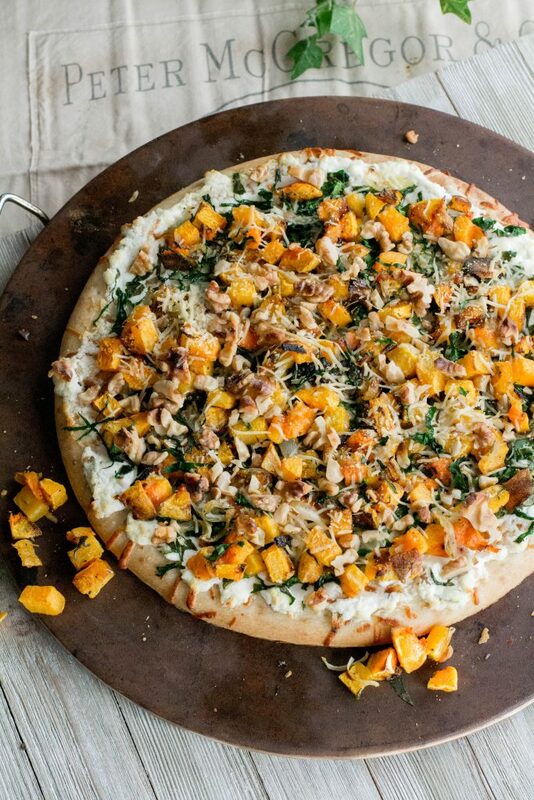 Butternut squash is my all time fav in the world of squash. It’s a bear to peel and chop, but worth it in every way…..or you can go the “lazy gal route”, my choice this time, and buy it pre-diced. Grocery stores carry a wide variety of ready-made items that save you time and in this case, possibly a finger….lol. I’m all for that! Boboli ready made crust is another of my go-to items. If you are short on time, these are great. Top and go. These crusts are fully cooked and ready to go…..perfect in this hurry up world we live in. About that goat cheese….. It seem people either love it or hate it. LOVE!!! In this recipe there really is no substitute for the goat cheese. Its creamy and tangy with beautiful white color that complements the green of the spinach and the orange of the squash. If you have never tried it be brave……it’s wonderful! 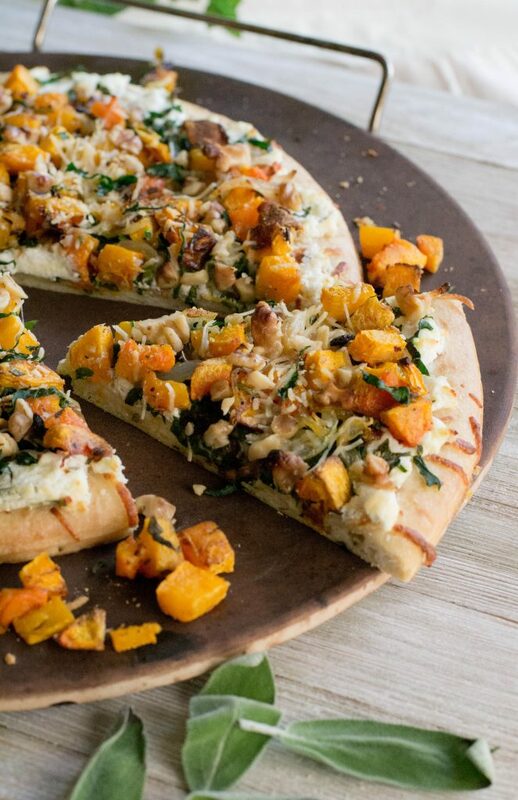 All the of ingredients of this pizza combine to make a satisfying fall pizza. Roasted, creamy,and squashy …….ha ha….. I didn’t think that was a word, but auto correct did not give me the dreaded red underline. Topping the pizza with balsamic glaze gave it just a extra little punch. I added some warm spice to a basic balsamic glaze recipe and it was luscious. 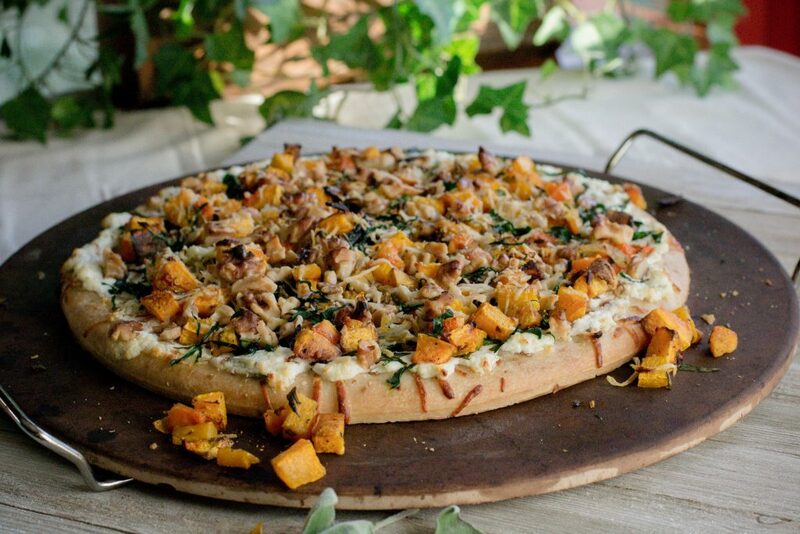 Try Roasted Butternut Squash Pizza with Balsamic Glaze for a change of pace pizza with the flavors of fall!! Preheat oven to 400* degrees. In a ziploc bag place diced squash, onion, salt, pepper, and oil. Toss to coat the squash and onion with oil. Place coated veggies on a baking sheet and roast for about 35-40 minutes or until the squash is tender and turning golden brown. In a small bowl mix together goat cheese, cream and sage and set aside. To assemble the pizza, spread the crust with the goat cheese mixture. Top with spinach, then roasted squash, parmesan cheese and sprinkle with the walnuts. Bake in a 400* degree oven for 15 minutes or until the parmesan cheese is browned and the remaining ingredients are heated through. Drizzle with Balsamic Glaze to serve. In a small saucepan combine all ingredients. Bring to a boil, reduce heat to low, and simmer until glaze is reduced by half, about 20 minutes.